Dictionaries, thinking caps and sphinx at the ready! Now you can play a relaxing word game in the Lost Desert. Test your smarts against the Scorchio Amarna. 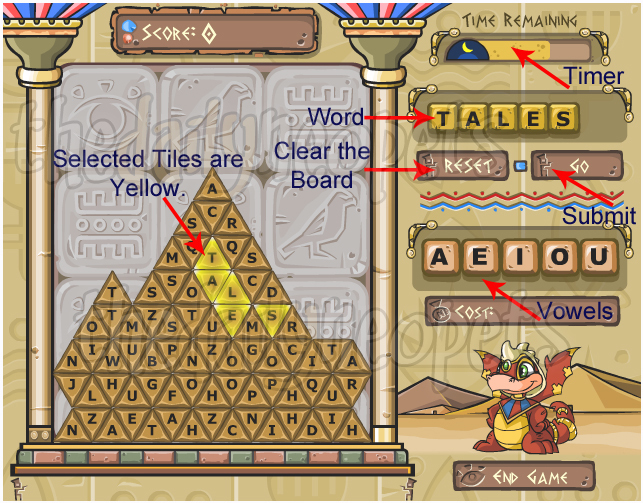 Word Pyramid is a brain-teasing delight! The game begins with a pyramid of tiles. These tiles are used to create words. Use your mouse to select letter tiles. When you're ready to submit your word, press the GO button on the menu to the right. As you submit words, more tiles will fall. Words created can only be up to 8 letters long. Only adjacent tiles can be used to create words. Tiles are able to be used as long as they're adjacent to any selected letters. This increases the possibilities for words to be created with the selection of tiles. A timer will begin counting down when the game starts. With every word submitted, the timer will increase. The timer will pause as new tiles fall into place. Larger words will replenish more time. Continue creating words to refill the timer and keep the game going. Accidentally clicking on a tile is not a big deal! Clicking the RESET button will deselect all tiles selected. From there you can continue. Submitting a word, not in the dictionary, resets the tiles. Amarna will also shake his finger at you. Above the reset and go buttons, is a block that shows the word created. Before submitting, it's helpful to doublecheck your spelling. Below that is a line of vowel blocks. These vowels are available to be purchased to make up for missing vowels on the board. Purchasing vowels will start at 10 points deducted from your score. Use this wisely! The more vowels you by, the lower your score will be at the end. It is important to note that purchasing more vowels will increase their cost. Occasionally, on the board, you will see a blank tile. This tile can be used to purchase a free vowel. Typing thelostdesert in game will reset the timer. This code can be used once per game and should be saved until you're very close to running out of time. You may be tempted to purchase vowels frequently. Doing so for short words will do more harm to your score than good. When buying vowels, use them for larger words where you're missing a vowel. It is not worth it to by vowels for short 3-letter words. Remember when buying a vowel, purchase it in the order needed for the word, or it may be misspelt. Once a vowel has been purchased it must be used, or it becomes lost. Before you begin, consider words that don't use vowels. Unfortunately, these are usually three letter words, like SKY and TRY. The longest word without a vowel is RHYTHMS. However, it is highly unlikely you will find that. This way you can keep the vowels for 8-letter words, like HATSTAND. Avoid words that are very vowel heavy. Your goal should be to stick with 5-letter words at the start. Create longer words whenever possible to increase your score and refill the timer. Sparingly create smaller words to avoid depleting the pyramid. Smaller words are best when the timer is running low. This game is not a race! Take your time and plan your moves carefully. Racing through the game will deplete the tiles. You will need to wait, wasting time, for more tiles to fall. When you have letters J, Q, V, X and Z, you will want to get rid of them as soon as possible. These letters are difficult to create words with. So, when you see an opportunity, take it! Valuable letters to keep for as long as possible are L, Y and S. These letters are used to make adjectives or plurals. Other important letters are I, N and G. Together these three letters can be used to make the siffix ING that can be added to many words, increasing your points. Having prior knowledge of words in the Neopets dictionary will be beneficial. If you feel like testing your knowledge and enjoy word puzzles, this may be the game for you!